Rapid development of portable electronics and electric vehicles requires lithium-ion batteries (LIBs) to have high energy/power density, low cost, good safety and long lifespan. In a commercial LIB, the traditional cathode and anode materials are LiCoO2 and graphite, respectively. Compared with the commercial graphite (theoretical?capacity 372 mAh g−1), the LiCoO2 has a low specific capacity of 150 mAh g−1 which becomes a big bottleneck of the battery breakthroughs. Among numerous cathode materials, Li-rich layered oxide (LLO) materials have attracted increasing attention as promising candidates because of their high specific capacity (> 250 mAh g−1) and high operating voltage (> 3.5 V vs. Li+/Li). However, an undesired spinel growth in the layered host structure usually occurred from the surface during the long-term cycling, which led to the fast capacity fading and voltage decaying. Prof. L. Q. Mai has led a research team at Wuhan University of Technology aiming to improve the electrochemical performance of electrode materials. They have developed a facile and general carbon coating technology. 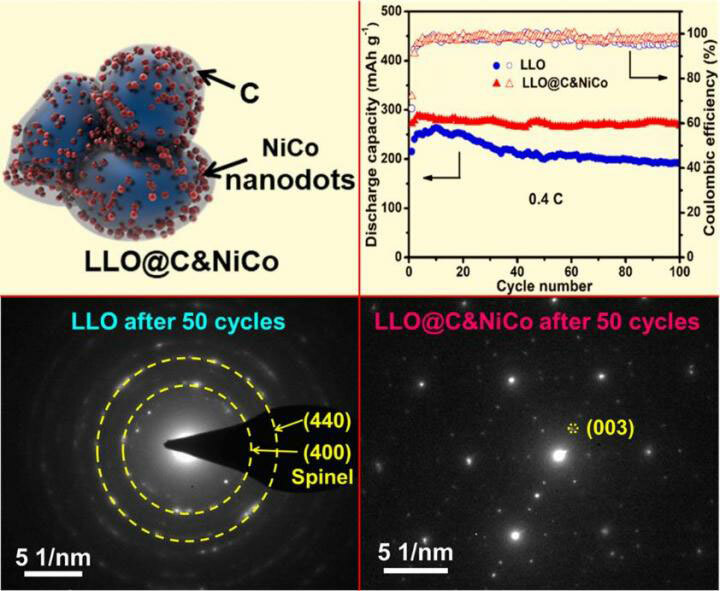 The unique NiCo nanodots decorated carbon shell was constructed on the as-prepared Li1.2Mn0.54Ni0.13Co0.13O2 nanoparticles masterly on this basis. The obtained [email protected]&NiCo cathode exhibits enhanced cycling and rate capability with a capacity retention of 95% after 100 cycles at 0.4 C, 90% after 300 cycles at 2 C and a high capacity of 159 mAh g−1 at 5 C, respectively. The in-situ X-ray diffraction, electrochemical impedance spectroscopy and selected area electron diffraction analyses after cycling demonstrate that the [email protected]&NiCo as a cathode material for LIBs exhibiting superior electrochemical performances, which is due to its unique protective C&NiCo shell. It promotes the electron conductivity (5 times), reduces the diffusion impedance, provides a robust structure for LLO which suppresses the undesired formation of the spinel phase initiated from the particle surface during cycling, and also protects the surface structure from side reactions at the electrode/electrolyte interface. Be the first to comment on "Novel Carbon Coating Technology of Li-Rich Layered Oxide Cathode"